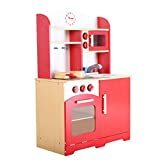 As we just bought a wooden play kitchens ourselves for our little boy who became 2, I have researched all the best wooden play kitchens reviews. Here is a list of the top 10 kitchens with their pro’s and cons. They are listed according to the best selling ones. I hope this list will save you some research time. As you will see a lot of the top 10 best sold wooden kitchens belong to Kidkraft, but there are some other good manufacturers. And now on to the best sellers list. The KidKraft Vintage Kitchen is available in blue, white and pink. Those colors combined this is the bestseller under the wooden play kitchens of 2018. Pro of the KidKraft Vintage Kitchen: This wooden kitchen is an update of my old plastic kitchen. As they love to pretend play in their kitchen I figured it is worth it the extra dollars. It has a great durability. Cons of the KidKraft Vintage Kitchen: I admit, to put it together took me about an hour and a half, it is not too difficult though. The second on this bestseller list is the KidKraft Uptown Espresso Kitchen. 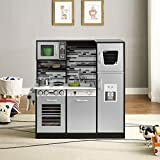 Pros of the Kidkraft Retro Kitchen and Refrigerator: It looks a lot like Pottery Barn’s play set but for a lot cheaper. All the wood is solid and sturdy. This will be a huge hit with your toddler and all their play friends. Melissa and Doug cutting food set fits in well. Cons of the Kidkraft Retro Kitchen and Refrigerator: The knobs in the front make clicking noises but thankfully not loudly. This Hape Gourmet Kitchen is greatly recommended for people on a budget or for people who don’t have a lot of space. Pros of the Gourmet Chef Kitchen: It is very compact so it will fits where others won’t. It doesn’t take over the room (though that has already happened with all the other toys so that is no point here anymore). The design is cool. The green color is not as awfully as on the picture. Plenty of place for utensils with two large cabinets. 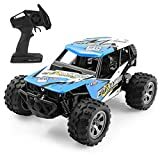 The build is quite sturdy and there are not many moving parts so it keeps out well. Cons of the Gourmet Chef Kitchen: The assembly should have been faster. It wasn’t difficult but took me a while. The faucet is not tight enough attached to the sink. Pros of the Melissa & Doug Cook’s Corner Kitchen: It is a nice looking and very sturdy kitchen. The timer really works, which most toddlers really love. Cons of the Melissa and Doug Kitchen: Easy to put together but it does take about 1 and half to 2 hour to do so. The sink bowl is not connected to the kitchen and that would have been handy with a 2 year old toddler. I easily solved it with some glue though. Pros of the Hape Creative Cookery Club Kitchen: It comes with lots of accessories which are all made from wooden, clean and nontoxic material. And this kitchen is Real, Real easy to assemble. One customer even counted the screws, only 12! Cons of the creative cookery club kitchen: A few customers say it is smaller then thought on forehand. And some people hate it that the bowl is attached to the sink so it is more difficult to clean then a removable bowl. This would be no problem in our house as I just use our vacuum cleaner to clean it now and then. Cons of the Cook Together Kitchen: The depth of the oven and dishwasher is too narrow (13″) to really pretend you are baking something in it. The only way things will fit in is vertically. Pros of the Deluxe Let’s Cook Kitchen Deluxe let’s cook kitchen: Finally a quite big kitchen which makes it more suitable for a bit older kids (4-8 year old) too! It has a lot of storage room. The knobs make a click sound which kids tent to love. All the corners are rounded for safety. Kitchen is made of solid wood. All in all an investment for years as your kids won’t grow out of it fast. Cons of the Deluxe let’s cook kitchen: It is a really heavy kitchen to move (but on the other hand this also means that you don’t have to worry that it will fall over). 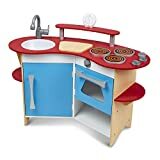 Pros of the Kidkraft Primary Wooden Kitchen: This kidkraft kitchen has a small footprint so it is handy for people with a small apartment / house. And though it is small all your toddler needs is there. It looks fantastic. Cons of the primary wooden kitchen: It is not so easy to assemble. The instruction even seems wrong at some point. Check out the reviews, some customers give tips on how to assemble it smoothly. Pros of the KidKraft Large Kitchen: According to users it has a nice color scheme, not to bright or tacky. (but with my two boys I’m not so sure if I like it) It is easy to assemble. And like all Kidkraft Kitchens it has a good customer service. Cons of the kidkraft large kitchen: In some reviews the durability seems to lack. On the other hand, in some other reviews the durability is praised. I don’t know what to believe myself anymore. A good thing that Kidkraft’s customer service seems to be good. Why would you chose a wooden play Kitchen? Once your little baby becomes a toddler, you will need some other toys then baby rattles. And preferably a toy that will keep your toddy busy for more than a minute. A play kitchen is a good choice for a lot of kids. – Where will you put the wooden play kitchen? Depending on how much space you have you can select the play kitchen set. 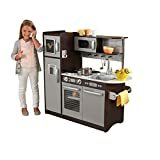 From a small portable toy kitchen, to a single unit multiple appliance kitchen, to a pretend island kitchen or even a a multi-piece pretend kitchen play set, everything is available. – How long do you keep it? This affects the price you are willing to pay. If you don’t know for sure if your toddler likes it buy an inexpensive used play kitchen from a yard sale or one of the plastic ones. Those are easier to sell after your kid is bored with it. On the other hand there are the nice wooden play kitchens available. Often those are good crafted toys with a great durability. Rhyse; Test-Team Member This is our youngest testing team member. He is now three years old and is not easy to satisfy. He doesn't like change and he often has a hard opinion on new things.